I have to admit that it had been a long time since I had watched “Toy Story” (yes shocking I know) before I went to see it in 3D at the cinema on Friday night. I have to admit it was a very exciting thing to be seeing this film in 3D, it just felt so right that it was in 3D. Yes, you have probably seen it like a thousand times like I have, but still seeing it in 3D was very special. I now cannot wait even more to see the 3rd installment which is coming next year. If anyone out there has been so unfortunate to have not caught “Toy Story” before it is about toys, yes I bet you would have never of guessed that. But not any toys, in this world toys come to life. 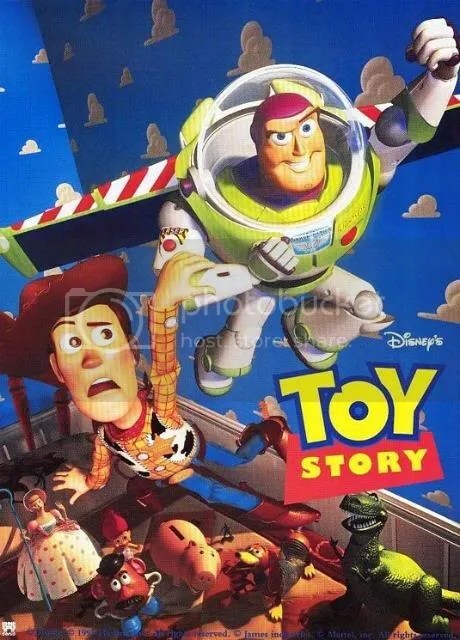 It is based around Woody (Tom Hanks) the cowboy who’s intimidated when his owner Andy gets a new favorite toy in Buzz Lightyear (Tim Allen) and does not play with his as much. While owner Andy is not there and the toys come to life Woody does not like Buzz and tries to get rid of him. However, this plan backfires when all of the other toys including mr potato head turn on Woody. They both end up in Sid who is a “toy killer” so an escape plan must be made to get back to Andy’s room before the move to a new house, however this does not happen and results in a chase to get on the removal van. I can still remember how much I loved this film when it first came out and went as 8-year-old to see this first time round at the cinema, so going again to the cinema to see this film again was still as exciting as back then even though I had now seen it so many times on VHS and then DVD. I think as a kid watching this film, you just think it would be the coolest thing in the world if your toys really did come to life when you werent there and that they went on adventures (this might sound saying this now, but that is definitely how I felt when watching this as a child, and I am sure most others did too). Disney/Pixar really did do something so different and special with this film, hence a sequel and most anticipated 3rd installment due out next year. They crossed lines and started off something new with the release of this film. It was a different type of animation than was used from Disney over the years, so Pixar really broke the mould and set a new level of how animation should be. Toy Story really is a good tale and brilliant film for children to watch, but also is good for people of all ages. I mean come on everyone has had toys when they were a child and must think it is very nice to see toys being the centre of a film. It was the first feature film made by Pixar and really changed how animation would be, which is such a bench mark. This film still remains one of the best from Pixar in my opinion, and has to be one of my favorite animated films ever.